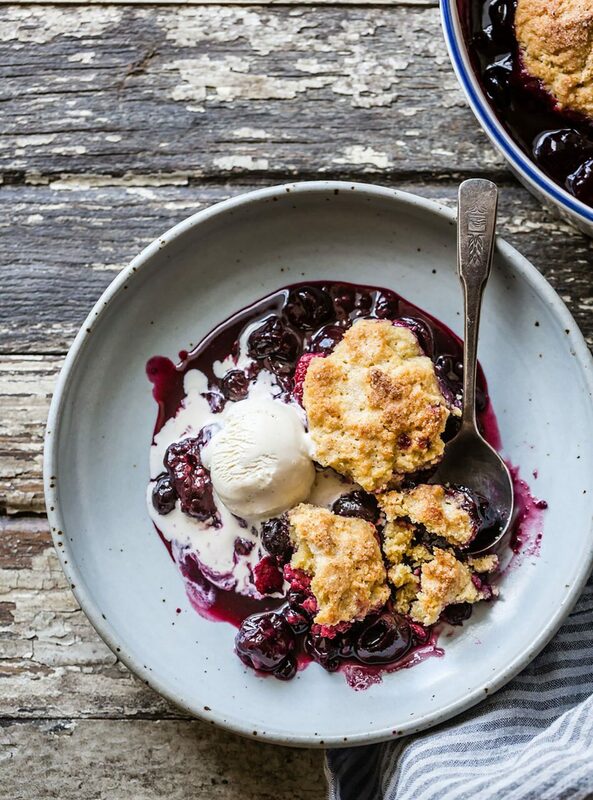 Adapted from Alanna Taylor-Tobin’s book Alternative Baker: Reinventing Desserts with Gluten-Free Grains and Flours, this gluten free cobbler uses the unusual technique of heating the dairy in the biscuits to give them instant lift. The corn flour–kissed biscuits bake into craggy cobbles— just the thing to soak in the summery flavors of sweet cherries and berries. MAKES 1 (9-INCH) COBBLER Frozen cherries and berries can stand in when fresh ones aren’t in season; just increase the baking time of the fruit to 30 minutes. The cobbler is best within a few hours of baking, but leftovers can be refrigerated airtight for up to 2 days. Reheat before serving. Position a rack in the center of the oven and preheat to 425ºF. Make the filling: Combine all the filling ingredients in a large bowl and toss to combine. Scrape the filling, including the juices, into a 9-inch round baking dish. Place the dish on a rimmed baking sheet to catch any drips. Bake until the juices bubble thickly, 20 to 25 minutes. Meanwhile, make the biscuits: In a clean, large bowl, combine the flours, sugar, baking powder, and salt. Add the butter and rub together with your fingertips or cut in with a pastry blender until the butter is somewhat worked into the flour with lots of pea-size butter bits. Refrigerate until use. Combine the yogurt and 1/4 cup cream in a small saucepan. Place over medium heat and cook, stirring frequently, until the mixture is hot and steamy but not boiling (or it might separate), 1 to 2 minutes. Quickly but gently stir the hot dairy into the butter-flour mixture until just combined, evenly moistened, and no floury bits remain. Do not overstir. After the filling comes out of the oven, gently stir to redistribute. Using a tablespoon, drop the chilled biscuit batter in one layer onto the fruit in 12 rough mounds. Immediately dab and brush the tops with the 1 tablespoon cream and sprinkle with the remaining 1 teaspoon sugar. Bake the cobbler until the biscuits are golden on top and the fruit is bubbling thickly, 20 to 30 minutes. Remove from the oven and let cool for at least 10 minutes to allow the fruit to thicken and the biscuits to finish baking from residual heat. Scoop into bowls and serve warm, topped with scoops of vanilla ice cream.